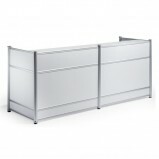 We offer a range of smart and well-finished office reception desks to greet any visitors to your office in style. Eco Reception Desk With Shelf Create an immediate first impression, make a stylish reception desk the first thing your clients see when they visit you. 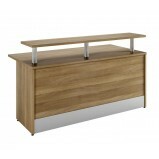 Eco is a range of wood grain finish reception desks FeaturesAdjustable feet25mm M.. 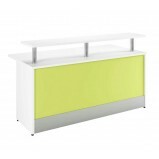 Mix & Match Reception DeskingThese reception units have beendesigned our to allow you to customise every aspect from finish to lighting.Simply choose your top and side colours to create your base unit - feel free to be adventurous .. 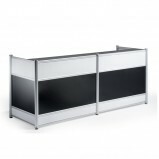 Welcome Reception DeskingYou only get one chance to make a good first impression with clients and visitors, so having a high quality front office reception desk is essential and will add a contemporary presence to any reception area. Welcom..